It bears repeating: plan your errands around your children's safety, not your convenience. Grocery shop at night if possible, and never leave your child in a car alone (air conditioned or not). More frugal suggestions can be found at Frugal Fridays hosted by Biblical Womanhood. 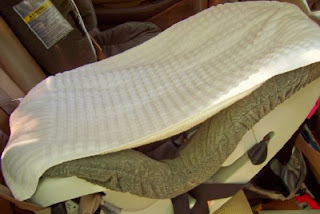 Your tips to keep cool in the car are great and I'll be using them in this August heat! Thanks a bunch for posting them. When it is HOT here I plan errands, Dr.'s appt. 's etc, in the early morning and together. Way before the heat gets going!!! Great post! Thanks so much for visiting my blog!! I was so excited to get a comment! BTW, it's GREAT to meet another fellow Coach's Wife AND Catholic mom! Yea!! It should be noted that in some states tinting your car windows at limo level is illegal, such as here in Louisiana. There are laws that tell you what percentage of visibility you must have, and you can be ticketed here for super-dark tinting. The percentage is on the label when you buy the tinting. That being said, I have my car windows tinted to the maximum amount allowed by the law, for the very purpose of keeping the car (and the kids) cool. I wouldn't want any of you nice ladies to get a ticket out of not knowing your state's laws. We drove around Australia pre-air conditioning. There was an icecream container with some water with the front passenger, who also had a supply of old flannelette nappies (diapers). Dad had strung wires above the doors. We wound the windows down a bit and hung a nappy over the wire. I remember feeling hot, but not horrendously so. Thanks for the tips. These helped our free Friday at the museum expedition last night. Mrs. H, I didn't know that! I think the tinting we bought is perfectly legal, as it is not as dark as I see other vehicles with tinted windows. The roll we bought is about as dark as the stick on window shades sold for children's windows. we take the drinks with us and we also take baby wipes with us - not leaving them in the car tho cuz they'll warm up too!- and wipe the littles necks and wrists etc to cool them off. i have a minivan and the air seems to skip the middle section til after an hour of traveling! My hubby used the damp towel idea yesterday when the heat was unbearable (almost 113 degrees outside). When I asked where he had gotten the idea, he said that I had left a window open on our computer, and this entry was on the screen.